It’s Friday, the weekend is near, the perfect day for a summery cocktail! I don’t need something frilly, I prefer simple and light drinks like a Hugo. This fruity long drink is from the Tyrolean region, it is originally made with sparkling wine but I like it with fruity white wine. The drink is mixed with elderflower syrup, mint leaves and lemon peel, all ingredients I find in my fridge or on the balcony apart from the syrup and this had to change! Not only does it make a nice cocktail it’s also deliciously refreshing in a glass of sparkling water with a slice of lemon, for those hot summer days ahead of us! That’s reason enough to make my own syrup. I jumped on my bike, went to the park and came home with 25 big elderflowers. They just started to blossom here last week, I noticed their sweet smell as I was jogging. I’ve been wanting to try this recipe by my mother for years, she has been making her own syrup since she first tried a Hugo. I was always too late to pick the flowers and didn’t want to repeat this mistake again. 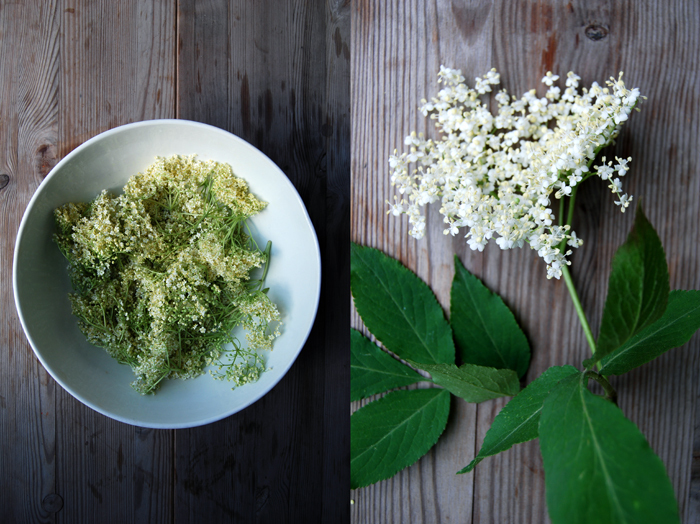 When I came back home with the elderflowers I was stunned by their beauty which tends to fade into all the leaves and flowers in the park so I never gave them proper attention. Their smell is enchanting and they feel so fragile! I rinsed them briefly before pouring hot water mixed with sugar and citric acid over them and then I had to be patient. They have to sit for 5 days, stirred once a day, they infuse the syrup slowly with their distinctive aroma. 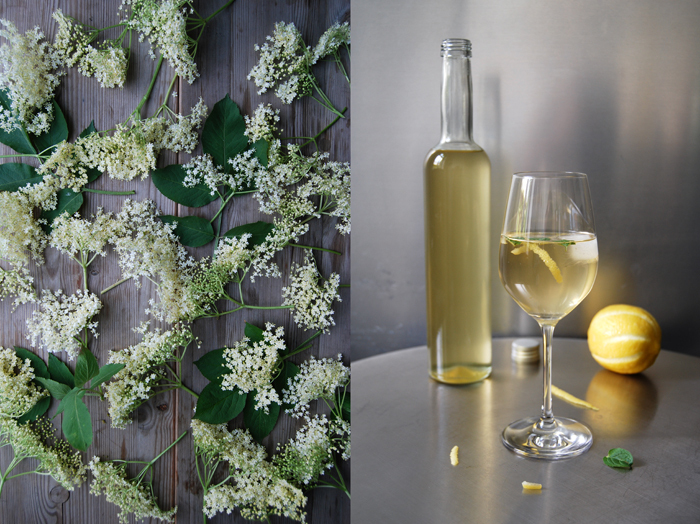 Strained and bottled, I was happy about my work, and satisfied to be able to make a Hugo with my own elderflower syrup from now on! In a large pot, bring the water to a boil and dissolve the sugar and citric acid in it. 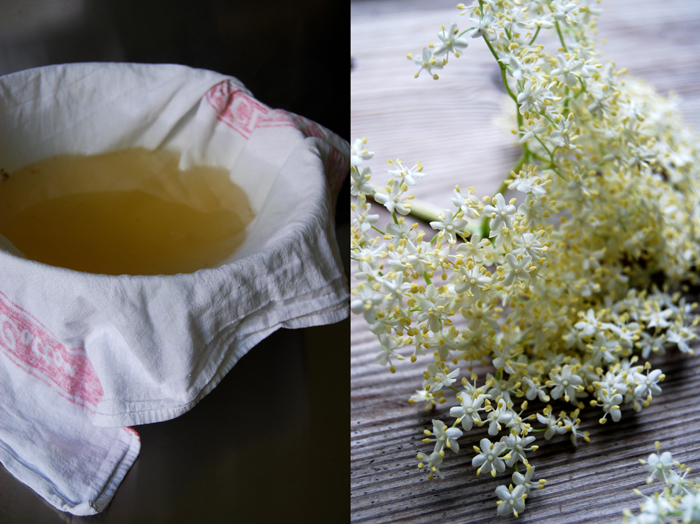 Place the elderflower umbels in a large ceramic or glass bowl (not metal! ), pour the hot water over them and put the lemon slices on top. 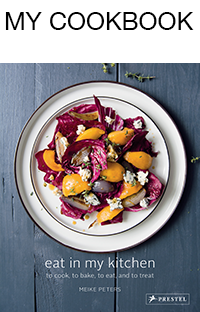 Cover with a tea towel and let it sit for 5-6 days at room temperature, stirring once a day. 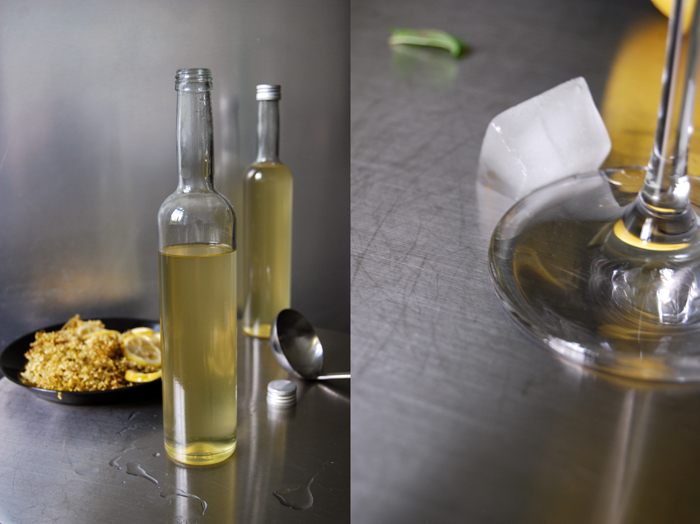 Sterilize glass bottles with spirit. When the syrup is done, strain it through a cotton or linen kitchen towel and bring it to a boil. Strain through a towel a second time and fill in your sterilized bottles. Close well and put in your pantry. The syrup will last at least a year at room temperature, open bottles should be stored in the fridge. Fill a wine glass with sparkling wine or dry white wine. 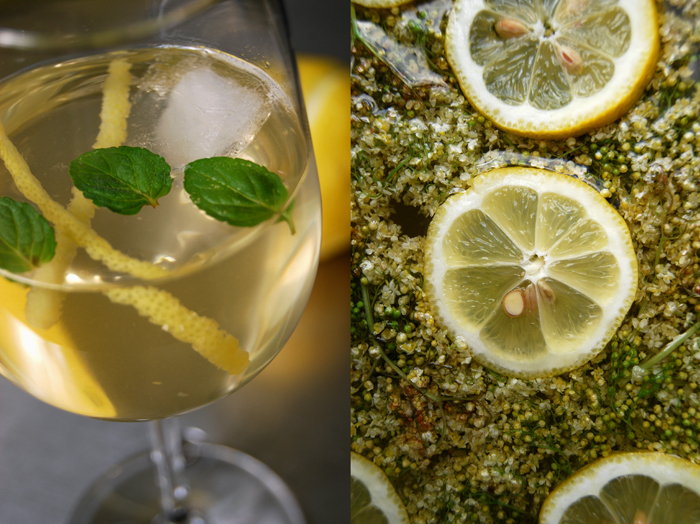 Pour in a dash of the elderflower syrup (to taste), add 1-2 ice cubes, stir and garnish with 2-3 strips of lemon peel and 3 mint leaves. I used to work with a Nikon D40 and now I have a Nikon D7100, I like working with both of them! 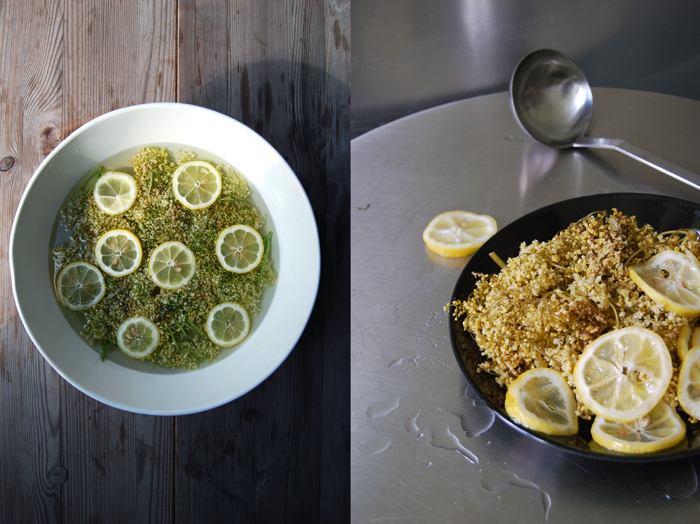 Yes, my mother loves her elderflower season projects 🙂 And I always listen carefully to learn from her culinary wisdom!